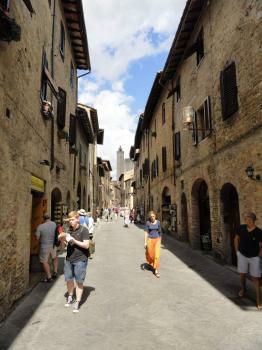 The Historic Centre of San Gimignano is known for its medieval tower houses and works of art. The towers date from the 12th and 13th centuries, when there were 72 of them (now only 14 are left). The two main churches in town are the Collegiata, formerly a cathedral, and Sant'Agostino. Both house a wide representation of artworks from some of the main Italian renaissance artists. The Communal Palace, once seat of the podestá, is currently home of the Town Gallery, with works by Pinturicchio, Benozzo Gozzoli, Filippino Lippi, Domenico di Michelino, Pier Francesco Fiorentino, and others. From Dante's Hall in the palace, access may be made to a Majesty fresco by Lippo Memmi, as well as the Torre Grossa which stands fifty-four meters high. San Gimignano is located about half an hour north of Siena. It's a typical medieval walled town, so parking is outside the walls. Because the city center is so confined behind these walls, it feels very authentic. Maybe even a bit too much, as I wrote "museum city" in my notes for today. A number of churchgoers and a handful of tourists were the only people around. Most of the towers are located around the two main squares. They really look like skyscrapers, but almost without any windows! I usually don't climb towers anymore, but this city is all about these things so I felt I had to. For a 5 EUR entrance fee you're allowed to climb the 150 or so stairs to the top of the Torre Grossa. Fortunately the stairs have all been refurbished to 21st century standards: they are wide and strong enough to receive hordes of tourists. At the top you can walk around in the open air and enjoy a 360 degree view of San Gimignano and the surrounding Elsa Valley. At the bottom of the Torre Grossa lies the Palazzo Communale. Here's where you find the city's other trademark: in situ works of medieval art (paintings and frescoes). Don't forget to take a look at the outer courtyard, which has pretty frescoes too. San Gimignano is one of the sites I knew I had been to as a kid, but never counted as visited. The simple reason was that all I remembered from the visit was the wild boar dish we had for dinner; it was delicious I believe. I had tried some years ago to right this wrong and combine San Gimignano and Siena in a day trip. But Siena's charm had gripped me and I decided to forego the trip to San Gimignano and spent the full day in Siena instead. Several years had passed when I finally arrived in San Gimignano. My expectations were rather high. This is the iconic fortified Tuscan mountain town. And truth be told: It's quite a site from the road when you pull up the hill by car or bus with all the towers rising to the sky from the city. Still, having been to Siena it felt rather underwhelming. It's really touristy and pretty small. In addition, there are plenty more Italian hill/mountain top fortified towns on the list and I can't really tell how San Gimignano distinguishes itself from other sites such as Pienza or Urbino, let alone Assisi. The closest train station is Poggiboni/San Gimignano. The city is another 12km from the station. There are busses running uphill directly in front of the station. You can buy the bus tickets at the bar in the train station. To save yourself the hassle also buy the return ticket. 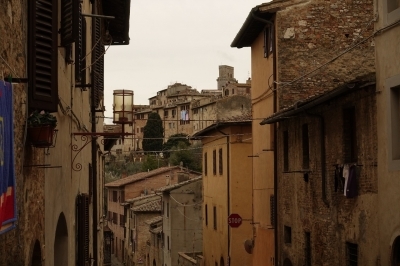 If you plan to return to Siena, you can continue on the same bus that is going down to Poggiboni from San Gimignano. Buying tickets on the bus is possible, but you will pay more. The system is quite simple: The drivers only sell 2€ tickets and you need to buy as many till you reach or exceed the cost of the trip. From Poggiboni you can connect West to Pisa, Volterra (T) and Lucca (T), North to Florence and the Medici Villas, and South to Siena, Val d'Orcia and Pienza. Pilgrims on their way to Rome visited San Gimignano quite often. Not to pay hommage to the the town's godfather Gimignano but to a girl named Fina. Probably because the inhabatants felt they needed a new saint to please the travellers they came up with a girl named Fina, made her a saint and told stories about all the miracles she performed. It did wonders for the town's economy. I visited this WHS in November 2002. The City of Towers is striking both beneath the valley and inside the historic centre. The vineyards, valley, terracotta tiled rooftops and towers create a painting-like view from several kilometres away! The haphazardly placed tower houses seemed to me to be an earthquake hazard. Maybe that is why there are no longer 72 standing. The walls and bastions seemed more structurally sound. 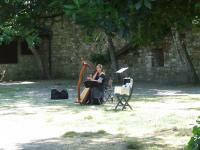 La Rocca was taken over by artists and musicians which provided a satisfying backdrop for my picnic lunch. 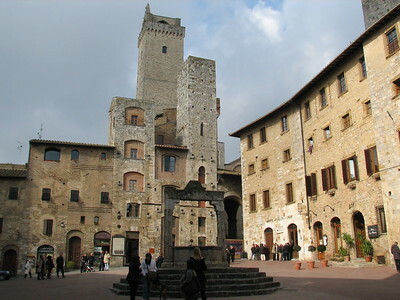 The nearest station to San Gimignano is at Poggibonsi, from where there are frequent buses to the Porta San Giovanni. In our trip to Tuscany we have visited the beautiful medieval market town of San Gimignano, situated on a hill of the Elsa Valley on the crossroads of the Pisana Road, that brought to the sea, and the ancient course of the Francigena Road, used by pilgrims to go to and from Rome, of which was a relay point. It was constructed by the bishops of Volterra in an area that was occupied in the ancient times by the Etruscans, became independent when had its first podestà (1199) and was prosperous until it was conquered by Florence, in 1353. In the 13th century it had 7000 inhabitants, like today, and 9 hospices for merchants. The change of the course of the Francigena Road and the rise of the nearby towns of Poggibonsi and Colle caused the economic decline of the town and the ending of all construction works until the 19th century. It was controlled by two major mercantile rival families, that were in conflict between them: the Ardinghelli, Guelph sympathizers, and the Salvucci, Ghibellines. They constructed 72 tower houses (14 still survive), some as high as 50 m, symbols of the town and of their wealth and power, protected since 1282 by a law that forbade their demolition unless for constructing nicer buildings. The walls, reconstructed in 1262 and reinforced later by five towers, have a perimeter of 2177 m and five gates: of St. John, with a nice arch, of Quercecchio, of St. Matthew, of St. James and alle Fonti. The Street of St. James contains the Romanesque Church of St. Francis and the palaces Pratellesi and Cugnanesi and brings to the triangular Square of the Cistern trough the Becci Arch, part of the first town walls. The square, constructed in 1273 and enlarged in 1346, has a herringbone paving edged with bricks and a nice well and is bordered by the towers Andrighelli (two twin buildings) and Benucci, the houses Razzi, with double windows, Salvestrini, Rodolfi and the palaces Cortesi and Tortoli-Treccani, with a high tower. The most important public and private buildings (also the twin towers Salvucci) are on the main Square of the Duomo. The Romanesque Collegiate Church, preceded by a long staircase, consecrated in 1148 and reconstructed in 1460 by Giuliano da Maiano, has three aisles divided by columns. On the internal façade are frescos by Taddeo di Bartolo and Benozzo Gozzoli and, on two brackets, sculptures made by Jacopo della Quercia and painted by Martino di Bartolomeo. On the walls of the side aisles are frescos by Lippo Memmi, Federico Memmi and Bartolo di Fredi and in the presbytery a ciborium by Benedetto da Maiano. He projected also the beautiful Renaissance Chapel of St. Fina, together with Giuliano da Maiano, and its altarpiece; there are also frescos by Domenico del Ghirlandaio e Sebastiano Mainardi. The Palace of the Podestà (it was also an inn and a theatre) has the towers Rognosa and Chigi and a nice lodge with a triple row of stone seats. The People’s Palace (town hall), constructed in 1288, enlarged in 1323 and crenellated in 1882, has the Large Tower, 54 m high, and a nice lodge with two arcades. Inside there is the Council Hall, with frescos by Lippo Memmi, the Hall of the Secret Meetings, with nice wooden seats and a sculpture made of terracotta, and the Podestà’s Hall, with frescos by Memmo di Filippuccio. In the church of St. Augustin are stunning frescos, masterpiece of Benozzo Gozzoli and Piero del Pollaiolo, and an altar made by Benedetto da Maiano. The Franzesi-Ceccarelli Palace has an asymmetrical façade that circumvented a law which stipulated that no new palaces should be wider than 12 armspans for a linear depth of 24 armspans. In the town are many other monuments: the Castle of Montestàffoli, with a nice tower, the house of St. Fina, the Pesciolini House, the Palace of the Provostship, the Oratory of St. Francis, the Convent of St. Clare, the Hospital of St. Fina and the churches of St. Lawrence in Ponte, St. James, St. Peter, St. Bartolo and St. Jerome. This town is one of the most beautiful places I have ever seen (even if I was disappointed by the fact that the major monuments were closed) because its medieval character and the beauty of the monuments. It’s absolutely worth to be visited (if you go there you must leave the car out of the centre) and justifies the inscription. San Gimignano refuses to accept the fact that time has passed it by. Indeed, it has so fully adapted itself into a centre of tourism that it really has no need to welcome the modern world, except in the form of currency. It is known as the town of the towers, and, without dobut, the approach to the town as one drives from Florence, is astounding. The stone medieval towers dominate the skyline, while the bustle of tourists and merchants fills the streets below. It is these hulking structures that attract the busses of tourists, but, as with every Italian city, there is a wholy different attitude to be found among the little alleys and side streets of these towns. It is easy to forget, when one is touring Italy, that these towns are inhabited by ordinary people whose sole purpose in life is to watch and cheer on the Candians. But, yeah...we're still waiting on the room verdict. Just to tell al of you, we had a wonderfull time out there! The streets bring you to the middle ages, at night, all the tiny light on the walls give you the impression you're walking throuhg heaven on earth... a bit poetic, but I don't know how to discribe it otherwise! San Gimignano is surrounded by beautiful nature, enjoy the view just outside the walls of the town! That image is printed on your mind forever. Location for a classic movie: Tea with Mussolini (1999); Where Angels Fear to Tread (1991) with Helena Bonham Carter, directed by Merchant Ivory. 343 Community Members have visited.